WoPC Home > Argentina > Vigor > Vigor S.R.L. 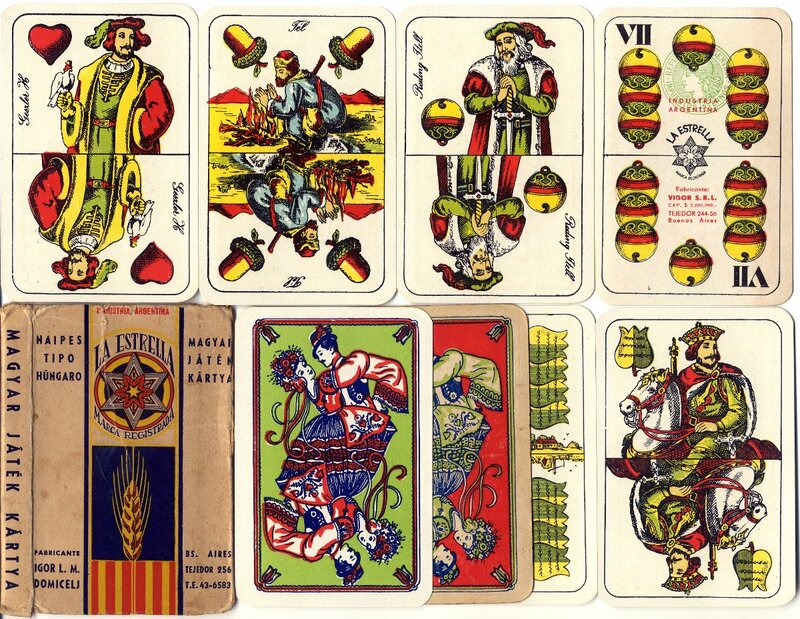 VIGOR S.R.L (1955 - c1975) manufactured a range of playing cards and card games, including “Chinita”, “La Estrella”, “Barcelonesa”, “La Española”, “Fantasio”, “Las Rosas”, “Pokerin”, “Ataque”, “Cartas Gitanas”, and a Hungarian “Seasons” pack. The name Igor Domicelj appearing on early packs (early 1950s) suggests that the company name “Vigor” may have been inspired by the founder's forename. At some later stage the company became Vigor S.A.C.I. After successively becoming Virgo S.C.A., and finally Gráfica 2001 ("Naipes La Española"), the firm’s successors are still active today. Below: tax band from a pack manufactured by Igor Domicelj, early 1950s. 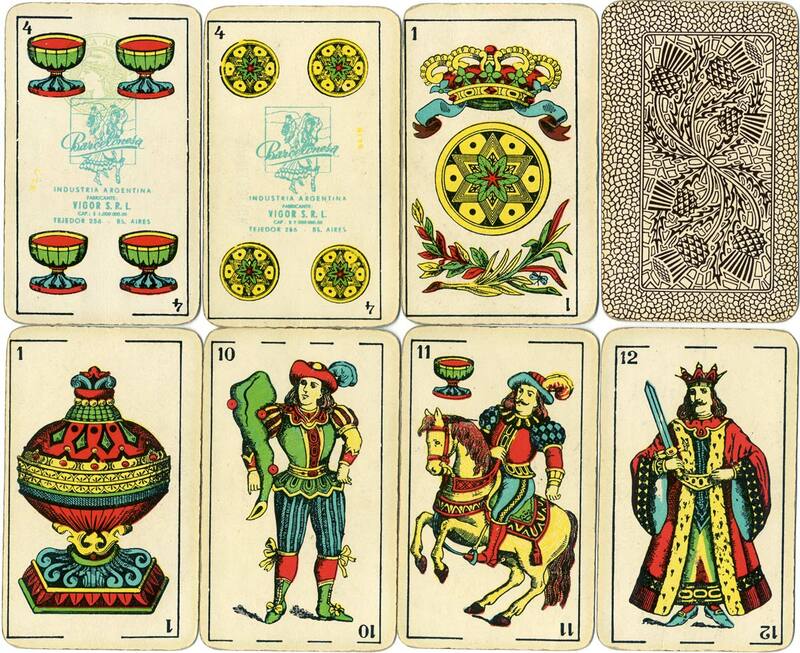 Above: Hungarian style playing cards manufactured by Igor Domicelj alias Vigor S.R.L. in 1950s and 1960s. The six-pointed star and wheat motif, which resembles a brand of health foods, appears to have been inherited from G. Berger who operated during the 1940s. 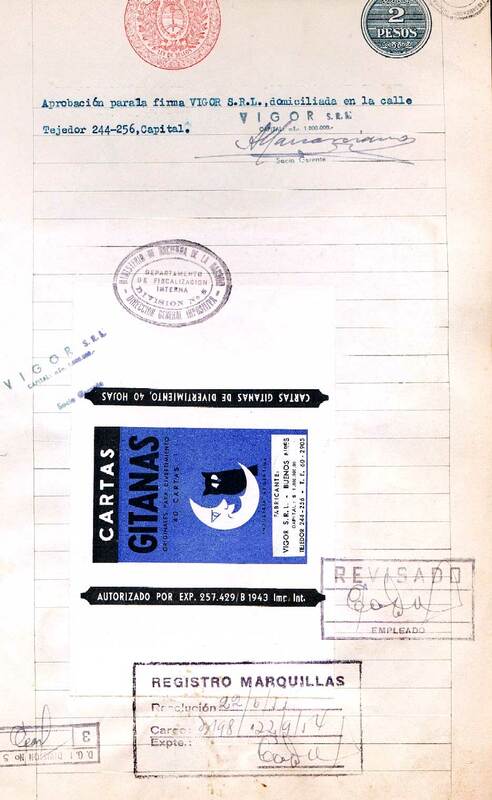 Below: Cartas Gitanas fortune telling cards, 1950s or early 60s. Originally published by Igor Domicelj, then in successive editions by Vigor S.R.L. into the 1960s. The Patent Office Registration documents, dated 1955, show the designs registered at the time of the take-over.